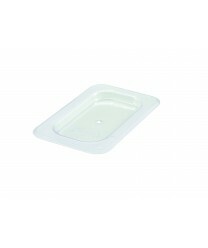 Seal in food freshness with the Winco SP7900S Poly-Ware Solid Food Pan Cover, 1/9 Size. This NSF-approved pan cover is made of break-resistant polycarbonate, so it will perform well in high-volume restaurants and hotels and at indoor or outdoor catered affairs. Able to withstand a range of temperatures, the clear polyware pan cover will resist warping and retain its original shape, even if subjected to regular and frequent use.